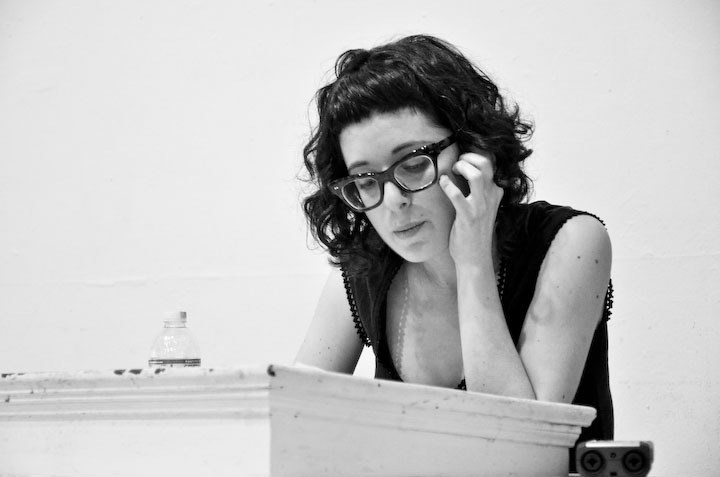 Our new week kicks off with a new author page for Bay Area poet Sara Wintz, showcasing a number of videos and audio recordings of recent work. First up, we have a pair of readings from Everyday Fashion: a brief video from the Quiet Lightning Poetry Series at San Francisco's Conservatory of Flowers recorded this past August and audio from a March reading at Small Press Traffic (thanks to Andrew Kenower's "A Voice Box"). Next, we have a similar pair of audio and video recordings of Wintz reading from Walking Across a Field We Are Focused on at This Time Now — this time from the same event at Oakland's Condensary in June 2011. Bringing the collection to a close is April 2011 reading at the Bowery Poetry Club as part of the Segue Series. Thanks to filmmaker Nathaniel Dorsky, we're able to share a stunning new silent short featuring Carl Rakosi . Filmed during the last year of the poet's life at the Arboretum of Golden Gate Park (just blocks from his home in the Sunset District of San Francisco), this five minute film shows Rakosi strolling with his companion, Marilyn Kane, talking and writing. It's a charming document, and one we're glad to be able to share with our listeners. 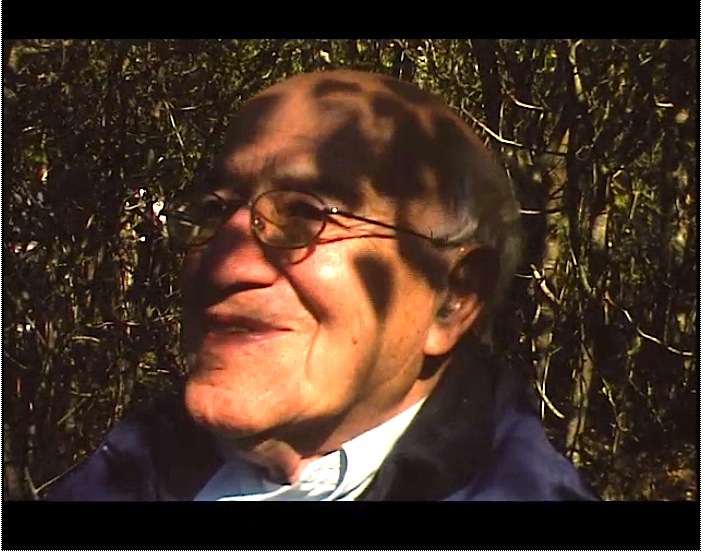 You can watch the film on our Carl Rakosi author page, where you'll also find a celebration of the poet's 99th birthday at our own Kelly Writers House in 2002, a link to Rakosi's 1971 appearance on Charles Armakanian's KPFA-FM program, "Ode to Gravity," and "A Moment with the Imagination," from the St. Mark's Poetry Project compilation album, The World Record. Just when you thought you'd already gotten all of the newly-added Carl Rakosi PennSound goodness that'd be coming your way this week, we've got something else! 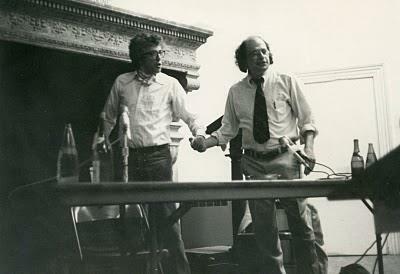 Thanks to Rachel Blau DuPlessis, we're now able to share a pair of length recordings (totaling more than three hours) of a panel and discussion of the Objectivists that took place at Naropa's Summer Writing Program in 1998, which features Rakosi and DuPlessis along with Michael Heller and Jenny Penberthy. 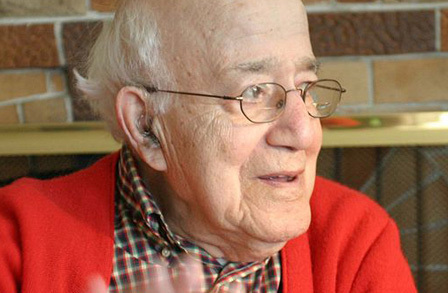 You'll find these recordings, along with the aforementioned Nathaniel Dorsky film, 99th birthday celebration at the Kelly Writers House and more on our Carl Rakosi author page. We wanted to make sure that you didn't miss out on John Ashbery's visit to UPenn this week as part of the 2013 Kelly Writers House Fellows program. First up, this evening, we have a reading by the poet, which begins at 6:30PM EST. That'll be followed up tomorrow at noon when Ashbery will sit down for a Q&A session with Al Filreis. Streaming live video of both of these events can be found here on KWH-TV, and audio and video will be added to PennSound's John Ashbery author page shortly thereafter. You can read more about Ashbery's Kelly Writers House Fellows visit here, and for a little bit of historic context, you can check out audio and video from Ashbery's first KWH Fellows visit, eleven years ago. We've now posted complete audio and video recordings from this week's 2013 Kelly Writers House Fellows events featuring John Ashbery. Monday night's hour-long reading is available as individual MP3s, as well as audio and video recordings of the complete event, and proceeds in chronological order, starting with perennial favorites like "And Ut Pictura Poesis Is Her Name," and "What Is Poetry," alongside contemporary work from Ashbery's lastest collection, Quick Question. That's followed by a seventy-five minute live Q&A session with Al Filreis, conducted Tuesday afternoon at the poet's home in Chelsea and webcast to the Writers House (and viewers worldwide). Complete audio and video recordings are available, and Anna Zalokostas, the conversations's been divided into thematic segments, from "on humor in Ashbery's poems" to "on aging, forgetfulness, and looking back at early work," and "on writing that deals with institutions and bureaucracies." The talk concludes with a reading and discussion of "Just Walking Around," which Filreis sees as a keystone idea in Ashbery's observational poetics. In case you still haven't had your fill of John Ashbery lately — even after last week's 2013 Kelly Writers House Fellows events — then you're in luck! 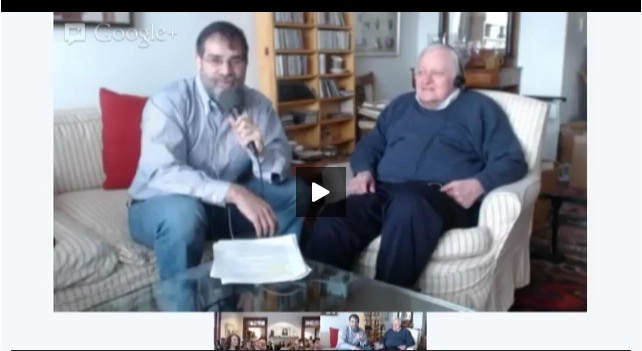 We have two new recordings from the poet that have just been added to our Ashbery author page. 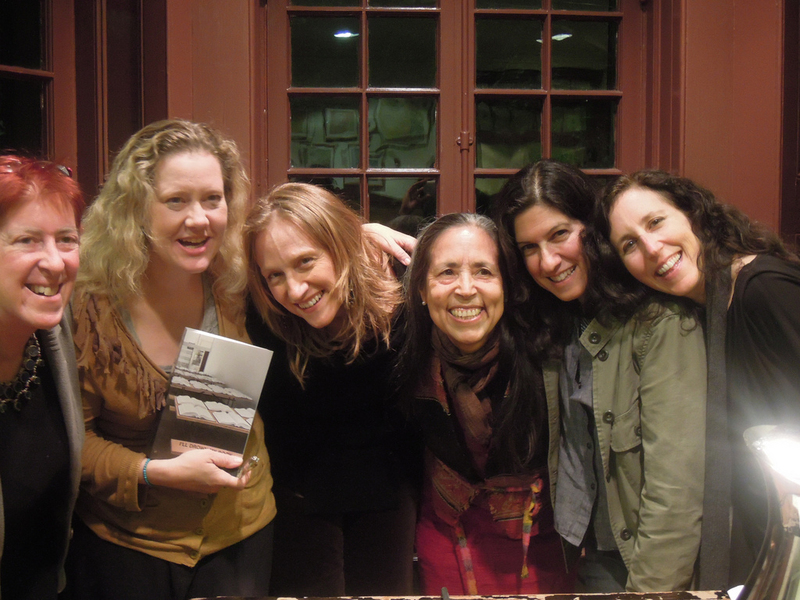 First up, we have an hour-long video from a November 2, 2011 reading at Smith College. In his intro to that event, Michael Thurston offers a brief history of critics' attempts to make sense of Ashbery's poetry, and revels in its blithe resistance to any such efforts. He opines that "we should read him by taking seriously the root meanings of the word 'poetry,'" — namely the Greek verb poesis, "to make" — before concluding with the notion that, "The best way to understand such work might be to stop trying to understand it." In this set, Ashbery begins with poems from his then-latest collection, Planisphere, before moving on to selections from his translation of Rimbaud's Illuminations and work that would eventually be published in Quick Question. Jumping forward nearly a year, we have a new hour-long reading from UMass-Amherst, recorded on September 20, 2012, which also showcases work from Quick Question. These recordings are the latest additions to PennSound's John Ashbery author page, where you'll find a startlingly thorough archive of the poet's work that spans sixty-two years. To start exploring, click the title above. Conceptual writing is emerging as a vital 21st century literary movement and I'll Drown My Book represents the contributions of women in this defining moment. Edited by Caroline Bergvall, Laynie Browne, Teresa Carmody and Vanessa Place, I'll Drown My Book takes its name from a poem by Bernadette Mayer, appropriating Shakespeare. The book includes work by 64 women from 10 countries, with contributors' responses to the question — What is conceptual writing? — appearing alongside their work. I'll Drown My Book offers feminist perspectives within this literary phenomenon. For this event, Browne was joined by Lee Ann Brown, Rachel Blau DuPlessis, Jena Osman, Kristin Prevallet and Cecilia Vicuña. Clicking the title above will take you directly to our I'll Drown My Book event page. Thanks to the efforts of Danny Snelson, we're happy to add a new reading series to the archive. the Koch-Dupee Poetry Series has its home at Columbia University, and our page for the series begins with two readings from last fall. First, from October 25th, we have Rob Fitterman and Trisha Low. That's followed by a November 30th event featuring Kristen Gallagher (who's currently posting some amazing commentaries over at Jacket2) and P. Inman. If these two readings are any indication, we'll have some wonderful lineups to look forward to as new materials are added.